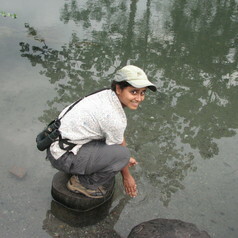 Madhura has a PhD in Ecology from the ATREE-Manipal Phd Program in Interdisciplinary Ecology. She has over 15 years of experience in using remote sensing techniques for mapping diverse ecological phenomena from fires in chaparral ecosystems to biodiversity in tropical forests at multiple scales. Her work deals with remote sensing applications to conservation issues, currently invasive plant species mapping in tropical forests and grasslands. She is interested in applications of geospatial techniques to wildlife habitat conservation related problems, and desires to work collaboratively with field ecologists for finding landscape level solutions to local challenges.